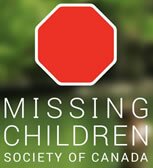 24 Hour Tip Hotline 1.800.661.6160 // Email Hotline tips@mcsc.ca // Twitter @MCSCanada // Since 1986, MCSC has assisted law enforcement and searching families with the ongoing and active search for missing children. PLEASE NOTE - If a Missing Person is found I remove the listing after a few days.. Some names are still active if they are not found.